If you are looking for smaller or slightly less formal accommodation on Edradynate Estate we are delighted to offer Aodin as a self catering holiday let. Aodin is located in some of the most stunning scenery at the heart of the 4,000 acre Estate. Recently refurbished (including new carpets, beds and furniture), and with electric heating throughout, Aodin can sleep up to 8 guests. The ground floor boasts a fully equipped and beautifully decorated kitchen with a large breakfast table, and also a Den with flat screen TV. There is also 1 king size bedroom and 1 zip and link bedroom, sharing a bathroom with bath and separate shower. The first floor has a stunning and spacious living room with dining area. 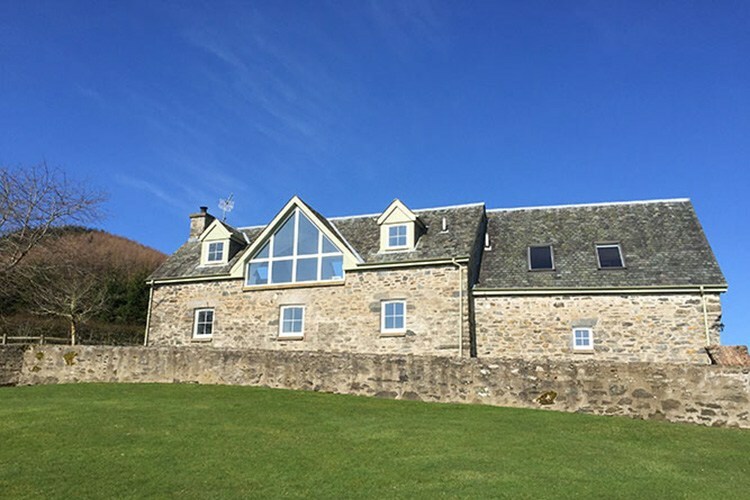 The view across the Tay Valley from the huge south facing windows is a treat whatever the weather and the room is kept cosy and homely with a wood burning stove, 50” HD TV and iPod dock. There is also 1 double bedroom and 1 twin bedroom, sharing a bathroom with shower, bath and separate WC. The large garden and grounds have picnic tables and a BBQ as well as children’s play equipment. As well as offering game shooting in season and clay shooting, the Estate has fishing rights on the River Tay (fishing is available by arrangement at an additional cost). Please do note that due to the location of the house, during winter months where inclement weather is always possible, a high set 4 x 4 will be essential as access issues can be possible. Aodin also accepts well behaved dogs by arrangement subject to additional deposit. For directions on how to get to Aodin simply click on the link below. To book your luxury holiday at Aodin, simply follow the link below, we very much look forward to hearing from you.